Classic Industries offers a wide selection of Grill Components for your Chevrolet Caprice. Classic Industries offers Chevrolet Caprice Grill Fasteners, Chevrolet Caprice Grill Moldings, Chevrolet Caprice Grill Mounting Brackets, Chevrolet Caprice Grills, and Chevrolet Caprice Headlamp Trim. Reproduction front grill assembly for use on 1986-90 Caprice models. Note: Shipped double oversize. Reproduction front grill assembly for use on 1991-96 Caprice models without fog lamps. Note: Shipped double oversize. Reproduction front grill assembly for use on 1991-96 Caprice models. Note: Shipped double oversize. 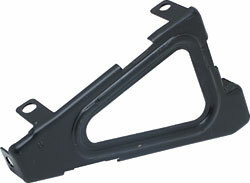 Install your 1991-96 full size Chevy grill correctly with this original GM replacement grill mounting bracket.